Stock photo shows the architectural detail at the entrance to Old City Hall, right next door to a mirrored skyscraper beneath the bright blue sky on a sunny day in downtown Toronto, Ontario, Canada. 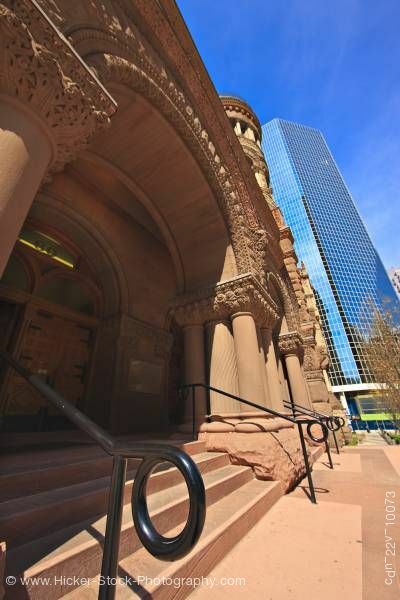 This stock photo of the entrance to the Old City Hall in downtown Toronto, Ontario, Canada gives you a beautiful view of the wrought iron railing that leads up the stairs toward thick stone columns and high archways, showing the old architectural detail of this building. There are no people in the scene and next door there is a new skyscraper, a mirrored building reflecting a bright blue sky on a sunny day.